Two years ago I noticed that several mainstream magazines, including Gourmet, published little factoids stating that brown hens lay brown eggs and that white hens lay white eggs. 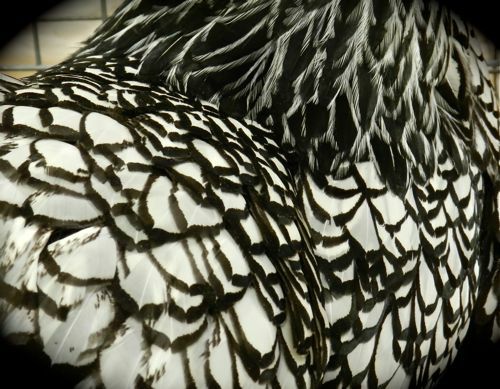 Did they not know, I wondered, that there are hens with feathers like this? I contacted Gourmet Magazine to find out where they got their information. I was not surprised that it came from an egg lobbying group. If you go to the United Egg Producer’s web site it states: The breed of the chicken determines shell color of an egg—the white hens lay white eggs and the brown hens lay brown eggs. Which is true, I suppose at commercial egg facilities (I refuse to call them “farms”) where there are only two types of chickens – white and brown. 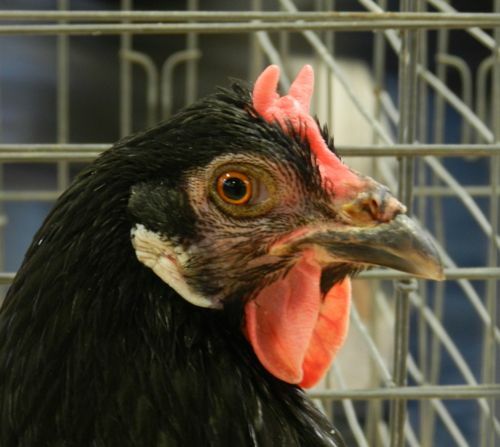 However, it is not true for this beautiful La Fleche hen. (She looks sweet even with that devil-horn comb!) Her feathers are black and yet she lays white eggs. How do I know she lays white eggs? That fleshy patch of skin below her eye is her ear lobe. It’s white, so her eggs will be white. 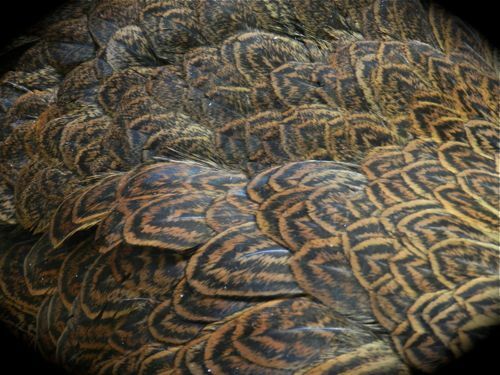 This Wyandotte’s ear lobes are dark-skinned and so she’ll lay brown eggs. 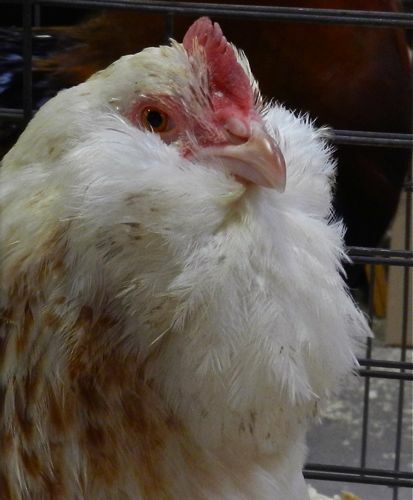 Blue and green egg layers also have dark ear lobes – which can be hard to see under an Araucana’s muff. The misinformation that the United Egg Producers send out irks me. It’s a subtle and effective propaganda used to get the consumer to see chickens as boring, uniform manufacturers of eggs. It further separates them from the animals that make their food. Which is a shame, since it’s a colorful and wonderful world out there if you know where to look. 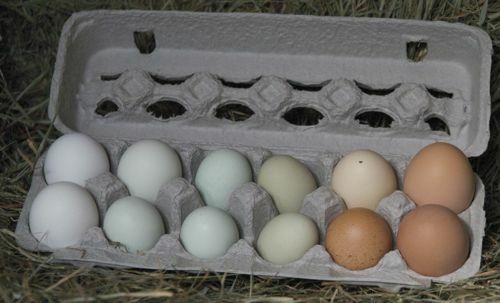 The last photo of the carton of a dozen eggs: is that the full spectrum of egg colors possible? Are those from your chickens? That photo was taken a few years ago when I still had a blue egg layer. Now my carton has much darker eggs, some speckled and some a light buff. Sadly, no blue. By the way, the “blue egg laying” hens lay a range from bright blue to grey to green. You never know until the hen starts laying what will come out! I had never noticed about the ear lobes telling the tale! Almost all of my hens have been brown-egg layers, from my mother’s New Hampshire Reds during the 1940’s (we got those because that was the breed favored by my paternal grandfather who made his living from chickens)to my Buff Orpingtons (1960 to now)+ the handsome Delawares that I added about 5 years ago along with some New Hampshire Reds. Among my “fancy” hens added this year, I did acquire one white egg layer–an Ancona. 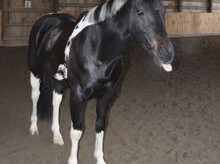 Shep, the dark-brown and white spotted Ancona, lays white eggs, not spotted ones. Muffy, the Ameraucana, is called blue (most of us would say she’s gray) and she does lay blue eggs! 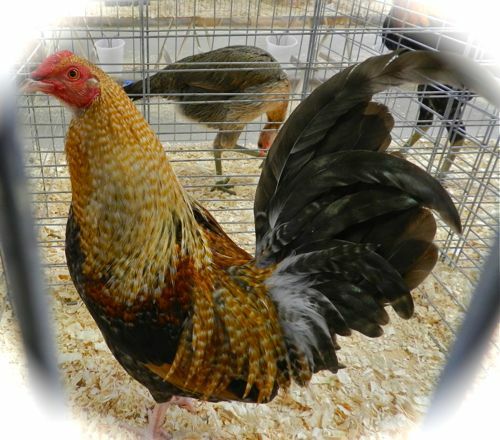 And the handsome Marans (copper necks and black or “blue” bodies) lay those nice deep brown eggs. So many different breeds of chickens and all of them beautiful in their own way! Such gorgeous close-ups. I understand there is an “Easter Egg” hen who lays light pink or blue eggs (one color per hen). Such amazing creatures God makes. Terry, I was happy to see that you contacted “Gourmet” magazine; hard to believe that the writer just went with what he/she was told. GEE. I don’t even HAVE chickens yet, and from doing my own simple research, reading your blog and others, even I knew that the egg colors were determined by the earlobe color! Yes, it is propaganda to try and influence consumers. Thank God for people like you, and for your blog; you tell AND show us the truth. Phooey on United Egg Producers. I love the variety of colors you’ve shown. My cartons look very similar. I offer eggs to the ladies at the barn where I ride. One of them said she appreciated the offer, but she can’t bring herself to eat brown eggs. Very odd, but that’s okay. She can continue to buy hers at the market and someone else will enjoy mine. That is so funny! I once had a teacher at my school come back and give me a carton with 2 eggs missing out of the dozen..He said the yellow/orange yolks were “weird” and he couldn’t eat them…I never respected him after that…go figure…..his huge, enormous loss! And I’ve had a customer who said the eggs were bad because the yolks didn’t break when the egg cracked. I had to explain that runny yolks are a sign of old eggs. Now I have something to report when asked “What did you learn today?” Never dreamed that the egg color correlates to earlobe color. Fascinating. Thanks again, Terry, for the education and gorgeous pictures. And shame on the United Egg Producers. Must admit I am a sucker for blue/green eggs. My husband SWEARS they taste better….LOL! In NYC farmers’ markets I’ve seen the blue eggs sell for $6 a dozen just because of the shell color! Loved your post. The dispelling of myths is so important, especially in this time when big business has so much power over our lives. The lack of concern from the general public about where their food comes from frustrates and saddens me. Get to know your local farmers, understand GMOs, and care about how your food gets on the table! It’s sad to hear how little people know about chickens. I find them so interesting. And there is nothing like a fresh egg! If only more poeple realized what great animals they are. Those store-bought eggs taste metallic to me. I think it’s the chemicals they’re washed in. Can’t imagine preferring that flavor. Just like most people out there don’t think through that a dairy cow has to be female AND have had a baby in order to give milk! I had a lovely pure white hen with tan earlobes and she laid lovely very light buff eggs. She was a foundling, so we never knew her breed. I am glad you contacted those people! The more people know, the better. I can remember when brown eggs were more popular because people thought they were more healthy, like brown bread! I am so glad that you dispell myths and I feel quite knowledgeable about chickens just from learning from your blog. There is no comparison between fresh eggs and shop bought and nothing nicer than fresh eggs. Very cool pictures!! I love the texture of the first one. I’ve had customers who only wanted brown eggs, thinking they are somehow fresher. I’ve showed them that on a freshly laid brown egg, that the color, which is only a tint, rubs off. Eggs come in either white or blue, you can tell by the inside of the shell. The outside is tinted with brown as it is layed. That is why blue egg layers can lay eggs that are khaki or green, the brownish tint is layered on top of the blue…and blue and brown make green in various shades! It’s all a diguise! Because I have chickens, some one at work told me that on one of the “Who Wants A Million” shows ( or whatever it’s name is)that the million dollar question was ‘What anatomy on a chicken indicates what color egg is laid?’ They asked me if I knew and they were amazed that I did. Too bad I wasn’t winning the $$$. I guess the brown pigment would be the original, “wild type” of egg, less conspicuous to predators, and white is just absence of pigment. But why, why do hens have ear color that corresponds with egg color?! Could somebody look real close, and determine if the ear is white because it lacks circulation or because it is actually a white pigment? This ear-color-correlation is so interesting and bizarre! It’s all in the genes! Egg color is controlled by genes. The genes that control colors are throughout the body and show up in such things as legs, ears, and sometimes beaks. 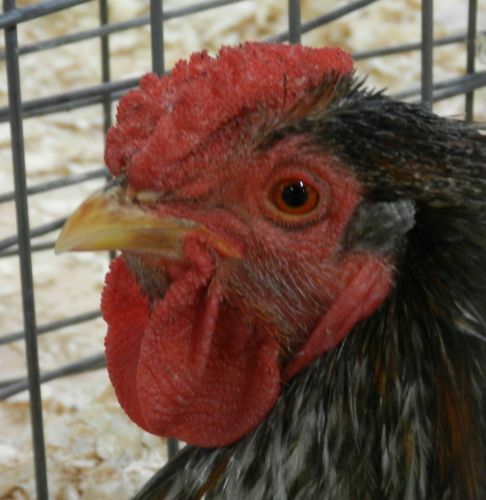 Ameraucana hens, Easter Eggers, have a “blue gene”. Those hens will lay blue eggs, and their legs and ears will show blue over natural color…this means their natural yellowish legs will show as green, and sometimes their beaks and ears. The brown is not actually a “color” but a tint that overlays the natural white or blue color and can be rubbed off easily. Right on Terry, thank you for such on going terrific information!! There’s a lot of misinformation out there about eggshells and pigmentation. EHow.com, for example, has some facts right and some wrong. I’ll be putting up a blog post soon to correct some of these misconceptions. For now I’ll simply say that it isn’t true that all pigment can be washed or scrubbed off of an egg. Stay tuned! Oh, if only I could have seen the customers’ faces when they got decorated eggs! It is stunning how many people think that a rooster is needed in order to produce eggs and that a cow gives milk all the time just …because! However, it really isn’t surprising given our food system. I never get impatient explaining to people how it really works; I’m just glad I finally know! Terry this is a wonderful web site and blog. Thank you! More patient explainers are needed. I’m glad you know and you do.